This all new Canon XA 30 is equipped with a 20x Canon optical zoom lens with a versatile 35mm equivalent range of 26.8 to 576mm, and features a 1/2.84", HD CMOS Pro sensor with enhanced sensitivity for improved low-light performance over the previous model. To fit into your workflow, the camcorders captures up to 1920x1080 video at 23.98p, 29.97p, 59.94p, and 59.94i frame rates, while also offering Slow and Fast Motion recording modes, as well as an interval recording option to capture fast motion of up to 1200x the original speed. 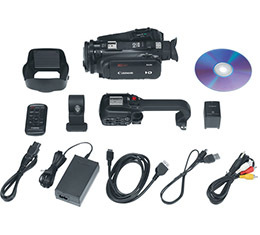 The main difference between the XA30 and XA35 is that the XA35 adds an HD/SD-SDI output for direct connection to a news truck, an SDI switcher, or other professional video equipment. While the XA30 does not support such connection, it still feature a mini-HDMI port for any video output.